US President Barack Obama is delivering a much-anticipated speech on US relations with the Muslim world. Correspondents say it will avoid specific proposals but will cover all major regional issues, including Iran and the Israeli-Palestinian question. As Mr Obama arrived in Egypt, Iran's supreme leader Ayatollah Ali Khamenei said the US was still "deeply hated" in the Middle East. Earlier, Mr Obama held talks in Riyadh with King Abdullah of Saudi Arabia. After landing in Cairo, Mr Obama headed in his motorcade to the Kuba palace along streets empty except for the soldiers lining the route. Mr Obama then held talks with Egyptian President Hosni Mubarak. Mr Mubarak said the pair had a "candid and frank" discussion of "all problems in the region", including Iran. Mr Obama said: "We discussed the situation between Israel and the Palestinians. We discussed how we can move forward in a constructive way that brings about peace and prosperity for all people in the region." He said the US was committed to working in partnership with countries in the Middle East. Mr Obama visited the Sultan Hassan mosque ahead of his speech at Cairo University. Mr Obama's aides said the speech, to be broadcast to an audience of millions around the world, would be a "truth-telling" exercise. The BBC's Christian Fraser in Cairo says Barack Obama wants to give a message of respect to a region which has often felt ignored, misunderstood or patronised by the US. Our correspondent says conservative elements in Egypt have suggested they are prepared to listen to Mr Obama as long as there is substance behind the rhetoric. The president is expected to use the speech to discuss the current state of peace talks between Israel and the Palestinians and to set out how he views the conflict. He will not include any specific proposals, but will articulate what he believes both sides need to do to resolve the current stalemate, says our correspondent. White House officials have said that one speech alone will not heal divisions but could start a process to "re-energise the dialogue with the Muslim world". Presidential advisers said there would be a "forthright discussion" of democracy, human rights and nuclear non-proliferation. However, they denied Mr Obama had issued any ultimatum to Israel on the question of settlement building in the West Bank. Israel is resisting calls to freeze building activity in all settlements, but Palestinian leaders have said there can be no progress towards peace without a halt to such construction. As Mr Obama arrived in Egypt, Ayatollah Ali Khamenei delivered a speech to mark the 20th anniversary of the death of Ayatollah Ruhollah Khomeini, the founder of Iran's Islamic Republic. Ayatollah Khamenei said: "The nations of this part of the world... deeply hate America. Even if they give sweet and beautiful [speeches] to the Muslim nation that will not create change. Action is needed." On the Saudi Arabia leg of his tour, Mr Obama held talks with King Abdullah. The president was presented with the King Abdul Aziz Order of Merit, the kingdom's highest honour. 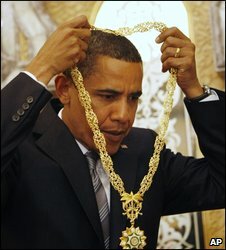 King Abdullah said the medallion was "only given to the very few friends of the king" and that Mr Obama was "certainly one of those". As Mr Obama arrived in Saudi Arabia, Arabic television station Al Jazeera broadcast a message said to be from al-Qaeda leader Osama Bin Laden. The message accused Mr Obama of ordering Pakistan to crack down on militants in the Swat valley and said Mr Obama and his administration had "sown new seeds to increase hatred and revenge on America". White House spokesman Robert Gibb said it was not surprising that al-Qaeda "would want to shift attention away from the president's historic and continued efforts to have an open dialogue with the Muslim world". Apart from a stop-over in Iraq in April, this is Mr Obama's first time in the region since becoming president. Mr Obama hopes to set a new tone which is designed to isolate extremists in the region and re-establish the understanding the US gained after 9/11 and lost over Iraq, says the BBC's Paul Reynolds. After Cairo, Mr Obama will travel on to Europe for D-Day commemorations. The BBC News website will carry a fully-annotated transcript of President Obama's Cairo speech, with analysis of key passages by BBC world affairs correspondent Paul Reynolds.